Personal data is information that, by itself or together with other data, can be used to identify you. 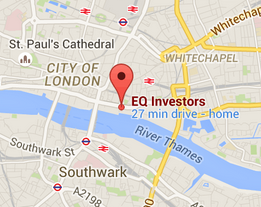 EQ Investors Limited (‘we’, ‘EQ’) is the controller of your information. We respect the confidentiality of your personal data and are committed to handling it securely. Identity details such as your name, age, date of birth, gender and National Insurance number. Contact details such as your email address, telephone and mobile numbers, home address, and social media accounts. Financial details such as your salary and other income, savings, investments and other assets, debts and liabilities. Family, lifestyle or social circumstances when this is relevant to a specific product or service, such as the number of dependents you have. Documents used to verify your identity, to prevent money laundering and fraud. Information connected to your product or service with us, such as your bank account details. Personal data about family members and/or other named applicants or beneficiaries of products you have with us. In this case you must have the authority to provide their personal data to us. Information provided by third parties, the scope and extent of which depends on the type of service you are taking from us. Sensitive personal data, includes information relating to your health or marital status, and information about children. We only collect and use this information where it is necessary to provide a product or service that you have requested or to comply with our legal obligations. In the case of children’s personal data, we require consent from a legal guardian to store and process their data. For our clients, the use of your information may be required in order to fulfil our contractual or regulatory obligations. Therefore, if you do not provide this information or restrict our use of it then we may not be able to provide certain services to you. Your data may be shared between the EQ group of companies and is used to administer the services we offer, to provide personalised financial advice (where offered), to enable consolidated reporting of your personal wealth and to inform you of research or services you may be interested in. Companies we have chosen to help us deliver the products and services we offer, including investment platforms, insurance product providers and email marketing tools. Agencies that we use to verify your identity and conduct anti-money laundering checks. We also make checks with organisations with whom you have insurance policies and investments. Your employer (in the case of corporate clients only). Our regulators, including the Financial Conduct Authority (FCA) and the Information Commissioner’s Office (ICO). Law enforcement agencies for the detection and prevention of crime.